We’ve had some rain the past few days and even some in the northwest part of the county that is usually dry. Today I was in the central part of the county and fields were still wet from rain yesterday. Although irrigation requirement is higher for blooming cotton than for pre-bloom cotton, stressing cotton during squaring has more negative effects than we realize. Cotton does not rebound if stressed from no irrigation through squaring. 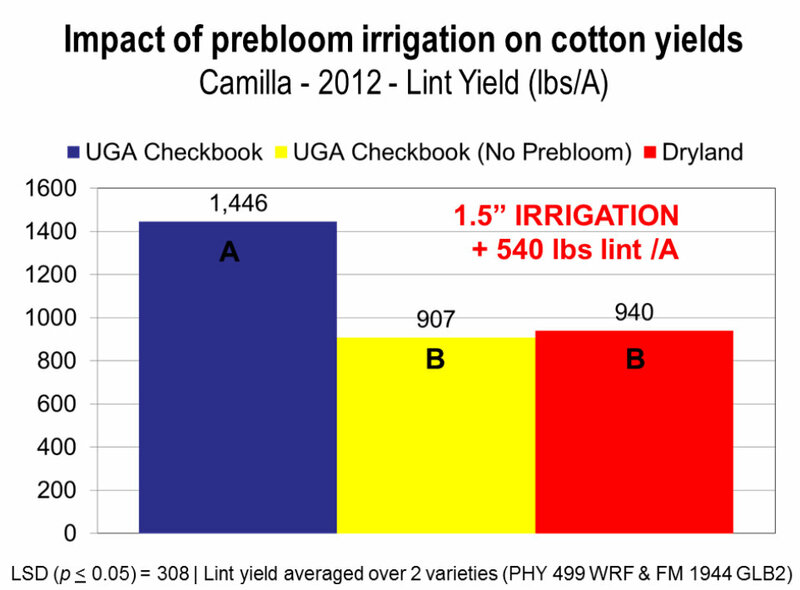 UGA Extension Cotton Agronomist Dr. Jared Whitaker conducted research on this using the UGA Checkbook Method where the pre-bloom irrigation was eliminated and they had no difference in non-irrigated cotton. The reason for this is that cotton grows vegetatively and reproductively at the same time. During its vegetative growth, cotton is setting nodes. If it is stressed during this time, less nodes are set. 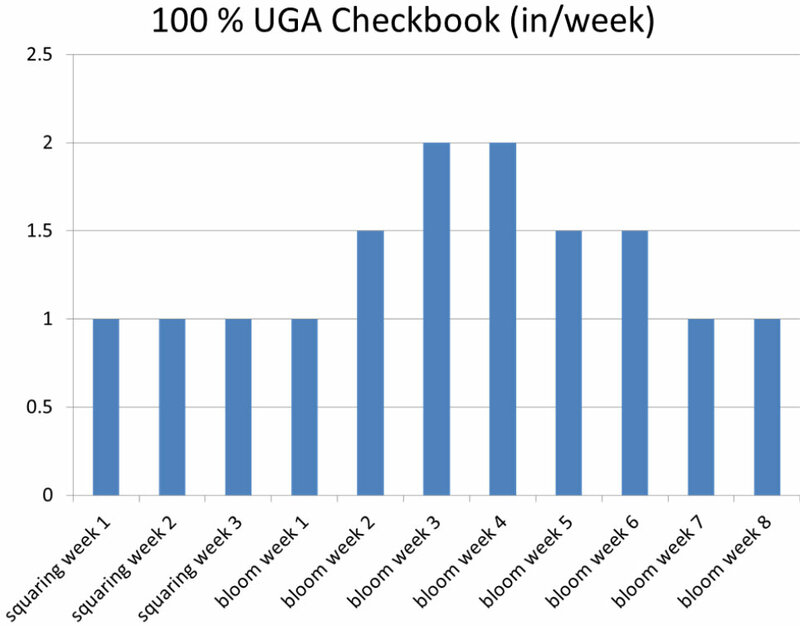 Below is a graph showing the research and UGA Checkbook Method. 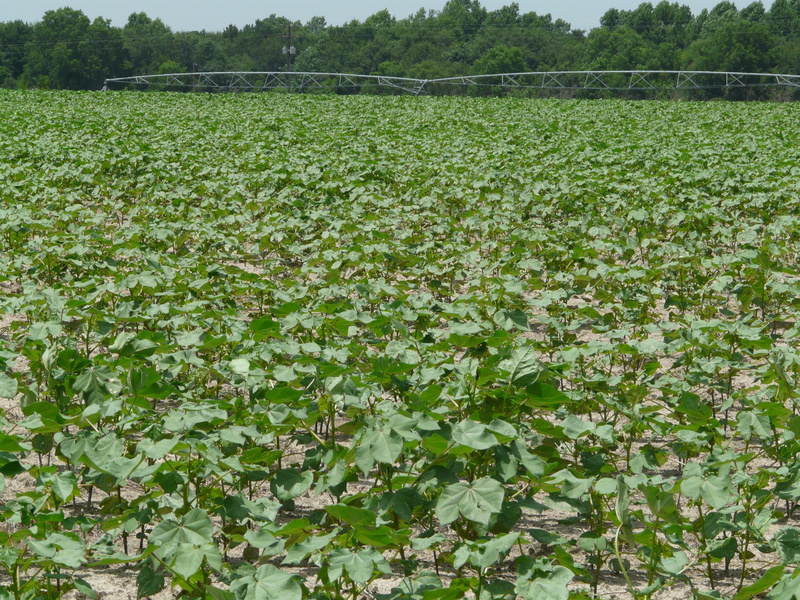 As cotton is squaring throughout the county, we need to also think about sidedressing. 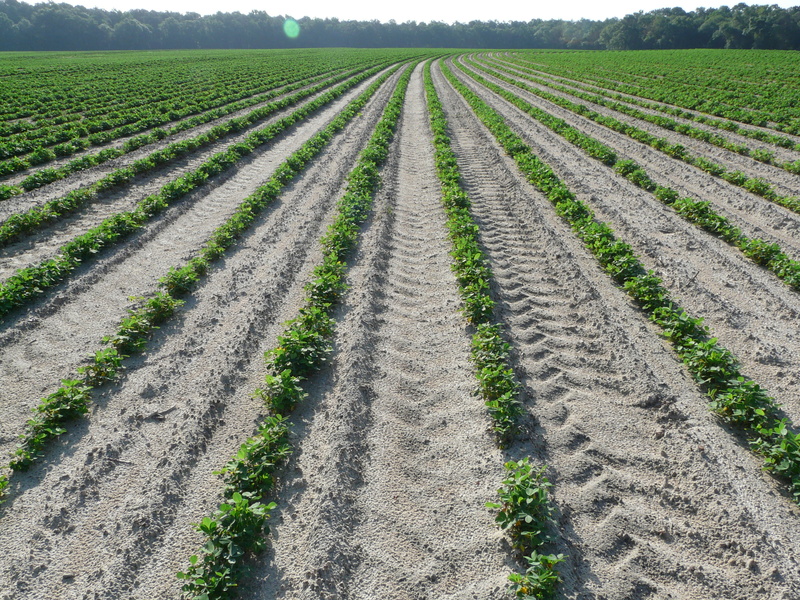 Here are some thoughts on sidedressing from the 2015 UGA Cotton Production Guide. Increase N by 25% if – Deep sandy soil, cotton following cotton, history of inadequate stalk growth. 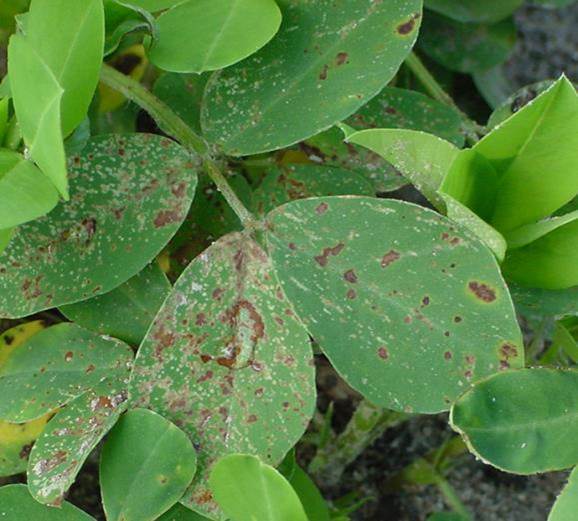 Decrease N rate 25% if – Cotton following peanuts or soybeans, cotton yellowing good stands of winter legumes, history of rank/vegetative growth. UGA Extension Scientist Dr. Glen Harris says our N rate should be applied in split applications since N is mobile in the soil. We want to apply 1/4 to 1/3 of recommended N at planting and the reminder at sidedress. Sidedress N between first square and first bloom. (If cotton is growing slow and pale green, sidedress more towards first bloom.) Sidedress N can also be applied as foliar treatments or through irrigation. No N should be soil-applied (including pivot) after 3rd week of bloom. P & K need to be maintained in the upper medium range by soil testing. All of the P requirements should be applied preplant since it is relatively immobile in the soil and important to seedling growth. K should also be applied preplant on all soil types including Piedmont, Coastal Plain, and Deep Sand soils. Split applications of K have not proven to be effective ton Tifton type soils. Recent field trials in GA have focused on additional soil-applied K during N sidedressing versus foliar K during peak bloom (4 weeks bloom). Dr. Harris says results on Coastal Plain soils indicate that foliar K may be more effective than sidedress K in improving yield. Currenty, foliar K applications should automatically be considered on deep sands, low K soils, high Mg soils, high=yielding conditions, short season varieties and where K deficienes have occurred. 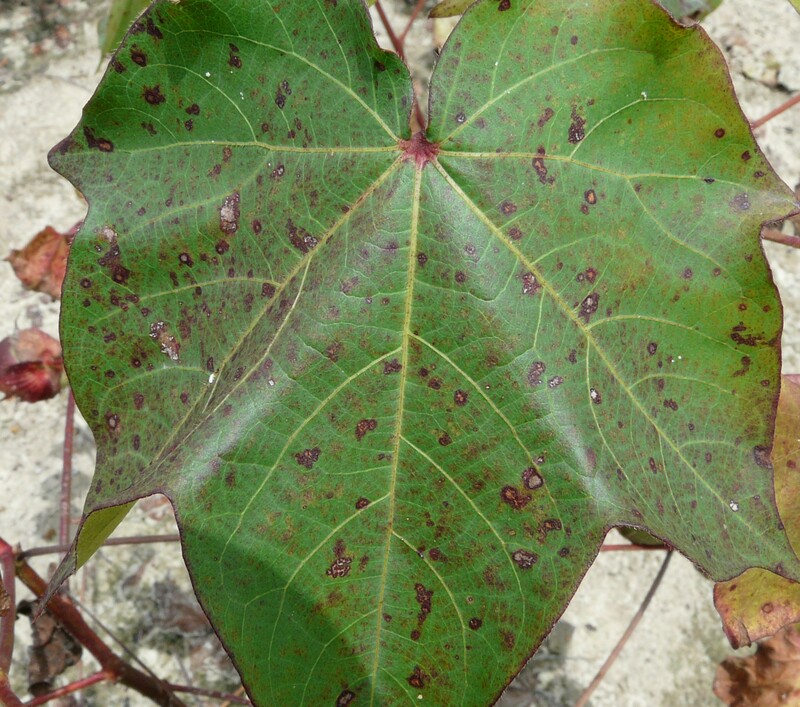 Cercospora, Alternaira and Stemphyllium leafspot have all been linked to K deficiency. They are secondary to K deficiency. Corynespora leafspot does not appear to be linked to K.
Last season, we had more plant bugs in cotton than we would normally be talking about. Cotton is now squaring and reports of a few plants are coming in. There are not many reported; however, scout Andrew Taylor took this picture of an adult plant bug. 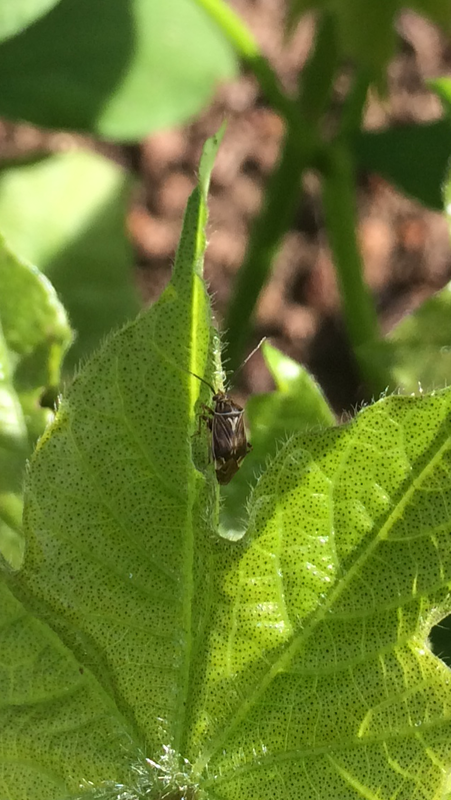 Here is a photo of an adult plant bug taken by scout Andrew Taylor. He is also reporting some “black flags”. Your maximum capacity to be applied in August and September is 3600-4000 gallons per acre per day within a 12 hour period. Percentages shown in the table above represent the percentage of this maximum capacity for each month. We are often asked, “Doesn’t a 60 year old orchard need more water than a 10 year old orchard?” The general answer is no. There is probably some wiggle room for certain situations, because many factors play into an orchard’s water demand – including the number of trees per acre, crop load, cultivar, nut size, hedging, etc. [For example, while an individual 10 year old tree’s water demand may not be as great as that for a 60 year old tree, there are fewer trees per acre in an orchard full of 60 year old trees (if the orchard has been managed correctly), thus the water requirements per acre are about the same.] Hedging may change this somewhat and we are working to try and determine any differences in water demand for hedged vs. non-hedged trees under our conditions as this practice becomes more common in the Southeast. For now, research has shown that the schedule above works for all bearing pecan trees grown under our conditions. 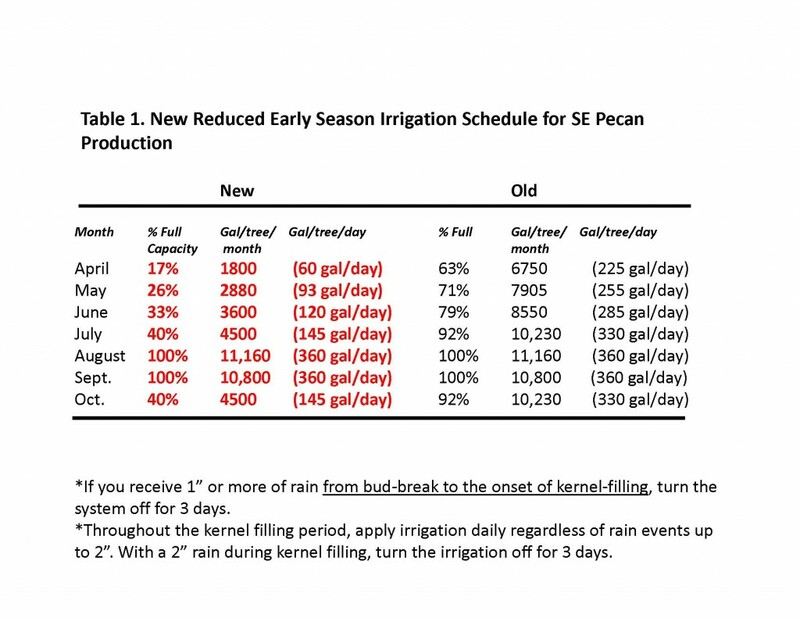 In addition, it is a 38% reduction in the amount of irrigation water applied over the previously recommended schedule, with all the savings coming from April-July. Many are concerned that applying less water than we had applied previously in June and July would limit nut size. This is a very important question, because nut size rules the pecan market at this time. However, our work over a 3 year study – including 2 years with very dry weather during these two months – has shown no loss in nut size, yield, or quality for the above schedule compared to the old schedule. In fact, nut size was even a little larger for the reduced schedule. The requirement for June is a little more than 1,300 gal per acre per day. In July the requirement increases to 1600 gal per acre per day. While this represents less water, it is no small amount of water and is quite enough to size the nuts. 2,4-DB + POST Grass Herbicice – This has shown to reduce grass control 8-15% about 45% of the time. Some may can take this risk, but most probably not. 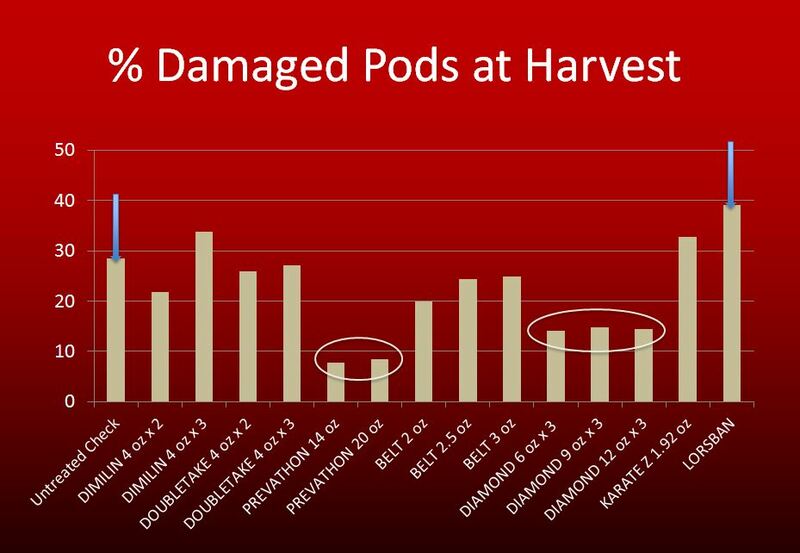 POST Herbicides + Fungicides – Studies with Dual Magnum, Warrant, Zidua + a fungicide tank mix in 2014 showed no negative yield effects when tankmixed with Tilt/Bravo, Abound, Fontelis, Provost, Priaxor, Artisan, and Absolute. 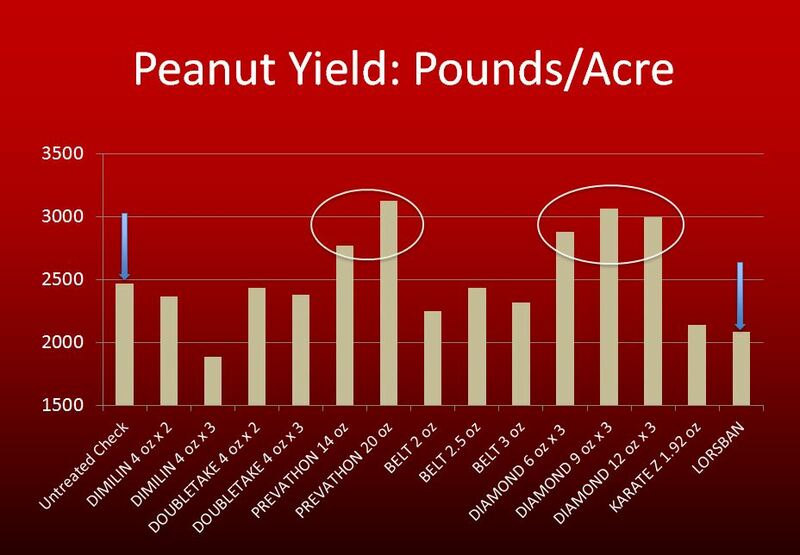 However, we are more likely to see peanut leaf burn with Dual Magnum. At this point, Dr. Prostko says having 2,4-DB in with all of our 30-45 DAP POST treatments is a good idea. This is for improved control of pigweed, sicklepod, morningglory. We also need to think about growth stage with some weed control decisions. Peanuts have good tolerance to Cobra when applied at the right time, for instance, but we need to avoid applications of Cobra after R5. 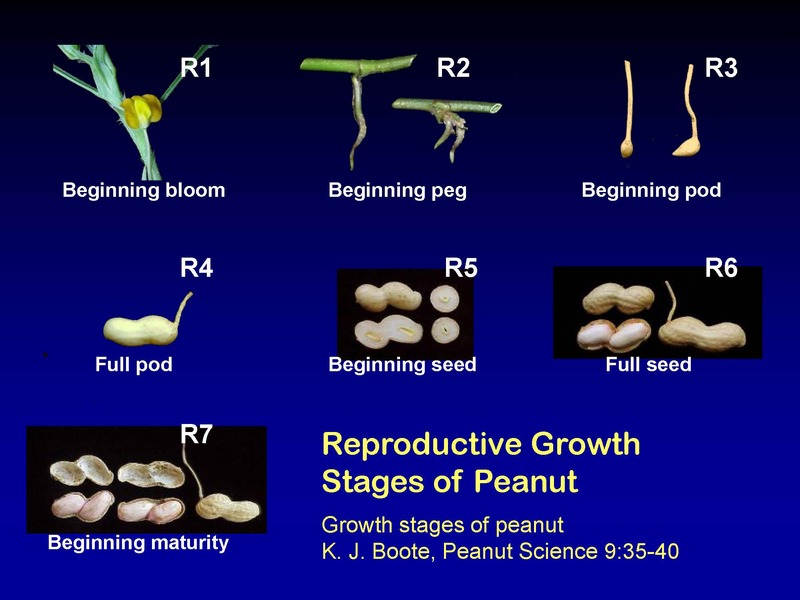 Below is a chart of peanut growth stages. Here’s an El Nino update from UGA Ag Climatologist, Pam Knox. From this we may have some wet weather in the near future then the forecast for a dry mid summer, and rain this winter. “In his briefing for the Appalachicola-Chattahoochee-Flint River stakeholder group today, Florida State Climatologist David Zierden noted that the eastern Pacific Ocean is nearly at the threshold for a strong El Nino now and should pass that threshold in the next month. He presented some information about what to expect from a strong El Nino based on composites of weather information from the strongest El Nino events. His summary slide is shown below.